Brazilwood, round stick, fully-lined ebony frog with Parisian eye, silver button and silver wound (immitation), and genuine horsehair. 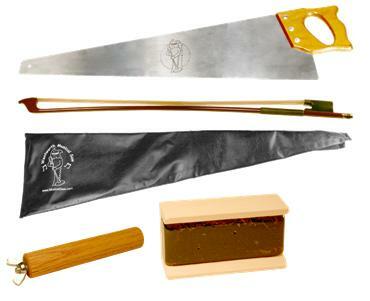 These premium bows are ideal for musical saws. The inherent firmness delivers the extra pressure needed when playing the musical saw. Tip Handles make Saw playing much more pleasureable. No more sore thumbs and wrists, you will be able to play for hours. Two page set of 7 lessons. You are guaranteed to learn in a week. This is everything you will need to play the saw. Plus you get a price break for buying the complete package. Copyright 2010 MusicalSaw.com. All rights reserved.